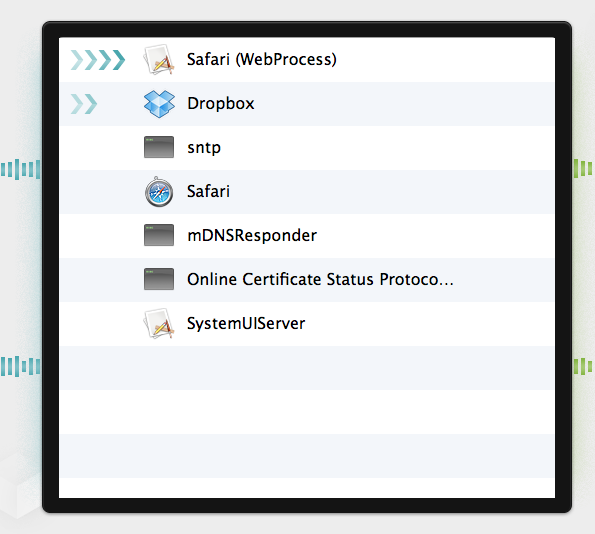 The application list shows the applications on your Mac that are actively using the network. This helps you understand, at a glance, which applications are using your network bandwidth. This can be incredibly useful if you are using a mobile hotspot like your cellular phone and have limited bandwidth. The list shows the applications that are currently using (receiving or sending data) or have recently used the network. The list is sorted based on which application was most recently active. When an application stops either generating network activity it will slowly fall down the list and eventually after it has been inactive for a few minutes fall of the list entirely. There are many processes using the network that you probably have never heard of, such as “mDNSResponder.” That’s okay, many of these are simply system processes that might have obscure names. You should be able to lookup any of these application on the Internet and quickly find out what they do. When an application is using the network, one or more arrows will be shown to the left or right. Blue arrows on the left indicate the application receiving data. Green arrows on the right indicate data leaving the application. The number of arrows drawn indicates how busy the application is relative to other applications using the network. The other type of application you probably have on your Mac using the network is an application that is listening for connection requests from other computers on the network. These are represented with four blue dots shown to the left of the application.